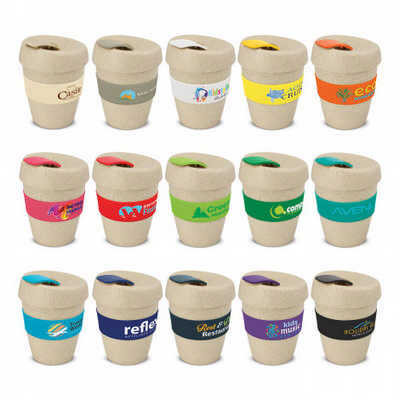 Design inspired 350ml reusable coffee cup that has an incredible story to tell. It is manufactured from a 50/50 blend of natural rice husk fibre and BPA free polypropylene. Rice husk is a waste product with little value and the agricultural industry often dispose of it by burning which creates air pollution. Using it to make a reusable coffee cup reduces the amount of plastic, accelerates its biodegradability and produces a trendy natural look. It has a heat resistant silicone band and a secure screw on lid with a splash proof flip closure. The flip closure and band can be mixed and matched in any colour combination from the colour palette. Up to five different colour combinations are included in the price and more are available for an additional charge. Handwashing is recommended and it can be presented in an optional black gift box. Express Cup Natura is protected under New Zealand Design Registration No. 419451 and Australian Design Registration No. 361937. Colours: Cup & Lid: Natural. Dimension: Dia 80mm x H 119mm. Print Description: Top - 45mm x 15mm. Print Type: Pad Print. Packing: Loose packed or an optional black gift box. Price includes : 1 Col 1 Pos Print. Setup is included.